The Strike King Series 5 Xtra Deep is an Xtra Deep diving version of the Series 5 with a unique curved bill and is balanced to cause a steep dive angle to enable this medium body bait to dive faster and deeper than other crankbaits this size. The 5XD Series has a bill designed to enable the lure to track well when in contact with the bottom. The longer you can cast the deeper a crankbait can go and this lure casts far! The Series 5 Xtra Deep is 5/8oz and dives up to 15 feet. 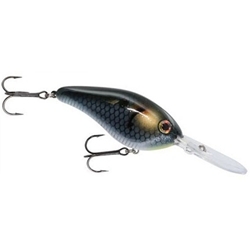 The Strike King Series 6 Xtra Deep is a large deep diver crankbait with a unique curved bill that allows the bait to diver deeper and faster than most other deep diving crankbaits. If you need a crankbait that will get down to those deep fish then this is the crankbait that you need! The Series 6 Xtra Deep is 1oz and dives 19 feet and beyond.